Luxurious ingredients that only nature can offer. Innovative care substances and the latest know-how from state-of-the-art biological science: all these are comprised in the natural Biolifting complex combined with white truffle. 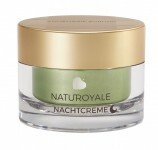 NATUROYALE is a revolutionary care range that activates the natural regeneration processes of the skin, stimulates the cell metabolism and increases the skin’s moisture levels. For an incredible lifting effect that firms and smooths the skin in just a short time and in a completely natural way, so that you can maintain the youthfully fresh radiance of your skin! This naturally effective lifting serum provides an instant kick of freshness that you can feel. The Biolifting complex, containing white truffle, supplies the skin with moisture, thus preventing the formation of new wrinkles and fine lines, and strengthening the skin's elasticity. An extract from the sand lily reduces the production of melanin and, with the power of nature, makes existing pigmentation marks look less severe, evening the complexion. The result: the skin is much smoother and, with regular use of the serum, has a more even and radiant appearance. It looks tauter, smoother and more supple. Application: Apply evenly to the cleansed face, neck and décolleté in the morning and evening. Then apply Day Active or Night Repair.